In hot rolling mills for long products, guide equipments guide the rolling stock at the entry and the exit of the roll pass so as to have smooth rolling of the rolling stock. The guiding equipments are to be sturdy, accurate and stable. Rolling mill guide equipments play a major role in ensuring the surface quality of the rolled product. The guides are to be designed for the wide variety of stock sizes and shapes which are normally encountered in the long product rolling. The guide equipments are usually classified in three ways namely (i) position with respect to the working stand (e.g. entry guide and exit guide etc. ), (ii) method of construction, and (iii) type of friction between the rolling stock and the working element of the guide equipment (e.g. sliding or rolling etc.). The entry and exit guides of sliding type are also known as static guides. The design of these guides is based on sliding friction. 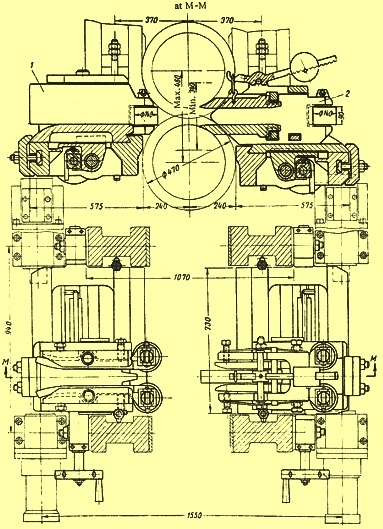 These guides are usually comprise of a guide box, two opposed blocks mounted in the guide box on opposite sides of the mill pass line and having longitudinally extending channels in their adjacent faces, separate metal plates bridging the respective channels and shaped to fit closely against the sides of the rolling stock traveling through the guide, and means to circulate water through the channels in contact with the outer surfaces of the plates. Static guides are robustly designed guides to withstand the demanding rolling mill environment. The design of the guides is to suite the specific roll pass requirement of the mill. Static guides usually feature a common guide holder so as to allow for reduced requirements of stock and spares. These guides can be adapted for all types of stand and rest bars configurations. Roughing mill entry guides usually have a fabricated steel design incorporating replaceable wear plates on the internal profile at the delivery section of the guides. The guides normally have a substantial wear allowance. The intermediate mill entry guides are usually made as interlocking cast steel halves with a single clamp. This type of design not only allows good rigidity and stability but also ensures fast and easy interchangeability. In these guides water is fed into the internal bore of the guide through single inlet. This arrangement helps in cooling as well as aids in the removal of build-up of scale in the chamber. The exit guides of the roughing mill are to ensure optimum delivery of the stock being rolled in the mill stand as well as smooth transition through the mill stands. The design of the exit guides of roughing mill usually comprise of two cast steel inserts having integral locking arrangement to secure two halves together. The two halves are easily mounted in a holder and secured by means of a rocker plate and a toggle clamp. The design normally includes a manual adjustment lever to simplify adjustment of the inserts into the roll bite. The exit guides of the intermediate mill usually have a round body two piece insert design. These inserts are profiled to the specific work roll on each stand. The two entry halves are held securely in the mount. The guides also incorporate arrangement for a water feed for cooling and scale removal. The design of roller guides is based on rolling frictions and hence these guides have a number of advantages over static guides whose design is based on sliding friction. Roller guides ensures faster and accurate adjustment of the guiding elements when compared with the static guides. Since the contact of the rolling stock with the guide is carried through the rollers working on rolling friction, it becomes possible to considerably increase the wear resistance of the working elements (rollers) and to reduce the possibility of such rolling defects like scratches, laps, and score marks etc. The construction and assembly of the roller guides is carried out with sufficient strength to withstand the frequent hits from the rolling stock being rolled which is usually moving at a very high speed in the modern mills. The presence of safety components in the roller guide design make it possible to protect the costly parts, which are seldom replaced. This is especially necessary in the exit roller guide, where there is possibility of the end of the rolling stock jamming as it comes out of the work rolls. Roller guide design usually make is possible to withdraw jammed rolling stock quickly. In modern roller guides, drop forged roller holders in spring steel quality, are used which enables thicker front and tail ends to pass through the guide without disturbing the original setting of the roller guide. The design of roller guides has undergone big changes with the introduction of faster continuous rolling mills. With the introduction of faster mills, the demands on guide equipment gave rise to new trends in order to control the higher speed ranges and cater for easy and quick changeability of guide equipment. Now the roller guides are normally designed for cassette mounting. The roller guides are simple and strong in design and have common components for different guide sizes and types of guides. The design of the roller holder usually allows a spring action which results into a high stability of the roller guide. The advantages include (i) improved surface quality of the rolled product, (ii) improvement in the size tolerances, and (iii) increase in the mill productivity reduced due to the set up time. These guides are resistant to aggressive operational condition and have better service life. They contribute to the reduction in the energy consumption during rolling. The specific consumption of guide equipment is also lower in case of roller guides as compared to the static guides. The guides normally need lesser adjustment and have easy access to all setting points. Roller guides can be made to cover complete range of guide sizes for all different shapes and steel grades. These days the design of the roller guides needs the manufacturing and assembly of a reduced number of parts without compromising any feature which is expected from a quality roller guide. This also makes the assembly process a lot quicker. Each arm of a guide has an adjustment point to set the roller profile height to the vertical center line of pass. At the same time each arm can be individually adjusted to the horizontal centerline of pass. Once set, a single point of adjustment is used for symmetrical opening / closing of the roller gap. Roller guides are normally available either with one pair of guide rollers or two pair of guide rollers. The guide features a robust fabricated steel body with replaceable wear plates and incorporates single symmetrical adjustment of guide rolls. The guides are constructed either with two roller holders and a spacer piece or with four individual holders one for each rollers. The guides also have a feature of independent direct lubrication and water cooling feeds for ensuring maximum service life in operation. This feature is well integrated into the design of the guides. Further preloaded high speed ball bearings are normally used for smaller guides while for larger guides, heavy duty tapered roller bearings are used since these guides are mainly to perform in roughing and intermediate sections of the rolling mill. Recently a new technology has been introduced for guide setting in order to get absolute accuracy. Under this technology a patented cam wheel is fitted with a worm wheel drive for precise setting in both adjustment made, the initial setting in the guide shop and the adjustment in the rolling mill. The high speed finishing block guides in a wire rod mill are normally manufactured with high integrity investment cast stainless steel for maximum wear resistance and component life. The guide features symmetrical wedge type adjustment mechanism with spring pre-loading for ensuring positive and accurate setting, eliminating adjustment creep. Roller height and roller to guide centerline are both independently adjustable. The guides are having a well-designed bearing arrangement which uses pre-loaded roller bearings. Cooling and lubrication media are fed directly to the guide through the adapter. Typical arrangement of entry roller guide (1) and exit roller guide (2) in a section mll is shown in Fig 1. The twist exit guide is usually designed to provide maximum stability where greater interstand distances are involved. The guide accommodates plane or profile rolls and features symmetrical roll gap adjustment and an easily accessible single point twist angle mechanism. The twist exit guide is either in outboard twisted style or of cartridge style. Both guide types are of fabricated steel construction with incorporated round body style stripper guides. Direct water cooling and lubrication are usually also included to optimize roll and bearing life. Separate mounting feet normally ensure that the guides can be modified to suit all types of stand and rest bar mountings. Slit rolling technology consists of a combination of mill roll pass design combined with specific rolling guides to uniformly separate the incoming rolling stock longitudinally in two or more sections, which can be rolled to finish sizes. This is done to improve mill utilization when rolling smaller sections. The range of slitting guides which have been developed facilitates 2, 3, 4 or 5 strand slitting. These guides are designed to provide optimum a stable product for the separating process. The guides are of fabricated steel construction and comprise of entry stripper, separating rolls, knife cassette, and exit tubes. The design also incorporates single point gap adjustment of the separating rolls.